Largest and Complete 19th/20th Century British Royal Navy Rum and Grog Collection of in North America! Photo Historical Documentation, Identification, and Research Analysis of the Various Sizes, Royal Navy Arsenal Markings, Naval Stamps, and Royal Ciphers as Found on 19th 20th Century British Royal Navy Imperial Rum (BRNIR) Ceramic Wicker Covered "Demijon" Rum Storage Jars or Breakers, Wooden Oak Mixing Tubs and Casks, Grog Copper Measuring Cups, Copper Funnels, Lipped Measures, and Rum or Spirit Pumps used in Storing and Dispensing the Daily Tot or "Up Spirits" Rum Ration, Rum or Grog Tot. 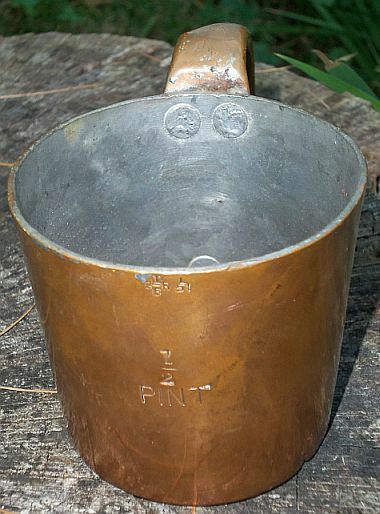 The Grog Measures Illustrated here are all Authentic Non-Machine Produced, Copper, Tin Lined, with Riveted Handles in 1 Imperial Gallon, 1/2 Gallon, 1 Quart, 1 Pint Measure, 1/2 Pint, 1.5 Gill, 1 Gill and 1/2 Gill Grog Measures. Examples Found both Unmarked and Well Marked, with Government-Issue In-Service Property Marks with Military Royal Navy Stamps and Royal Cyphers of Broad Arrows, Royal Crowns, Reigning Royal Monograms with/without Government Inspection Marks under Queen Victoria in the mid/late 19th Century, and later 20th Century under King Edward, King George V, or Elizabeth II. 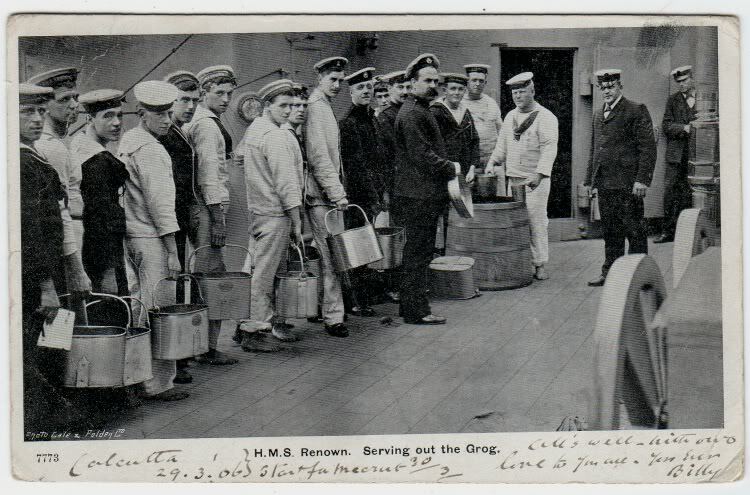 Above ca 1910 Photo to the left shows the Rum Purser (or "Pusser"), Royal Marines (or "The Butcher"), and Rum Bosuns from each Mess dispensing "the grog". Also illustrated above are most of the various sizes of the Rum and Grog Cups or "Measures" as they were called along with the Rum-Grog Mixing and Dispensing Wooden Barrels and Casks Known as "Rum Tubs", and the rare Rum Fanny! 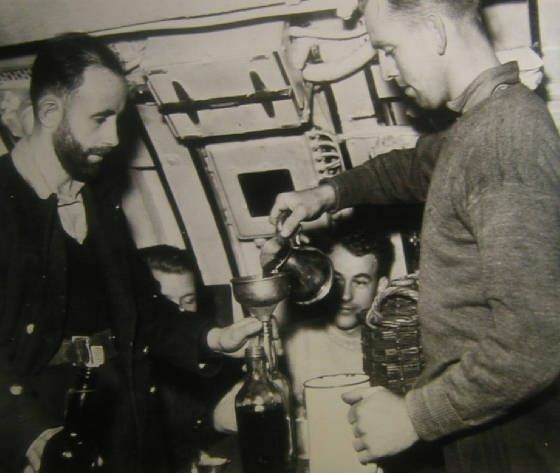 Photo to the right shows dispensing "The Grog" aboard an unknown WWII British submarine - note the wicker encased demijons which held the rum, the special funnel used, and the lipped measure or pitcher! Whether aboard a 100 gun 19th century ship-of-the-line or on a early 20th century battleship using an oak mixing tub, or within the confines of a submarine using a lipped measure the "grog" as mixed and served consisted of 1 part rum, 2 parts water, fresh lime or lemon juice and sugar to taste - Stirred, not shaken! 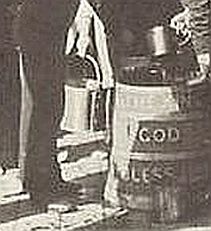 Shown specifically in the above photo are: 1) Large wooden rum mixing tub or barrel, 2) Smaller wooden rum mixing cask with handle standing on end and six pointed star representing the insignia for the Supply rating, 3) Large 4 Gallon Rum Fanny with thick iron handle made to hang on a hook, 4) Small 2 Gallon Rum Fanny pail with wire handle, 5) Large 1 Imperial Gallon Rum or Grog Measure, 6) 1/2 Gallon Rum or Grog Measure, 7) 1 Quart Grog Measure, 8) 1 Pint, 9) 1/2 Pint, and 10) 1 gill. Unfortunately a 1/2 gill Grog Measure is not shown in the above photo. 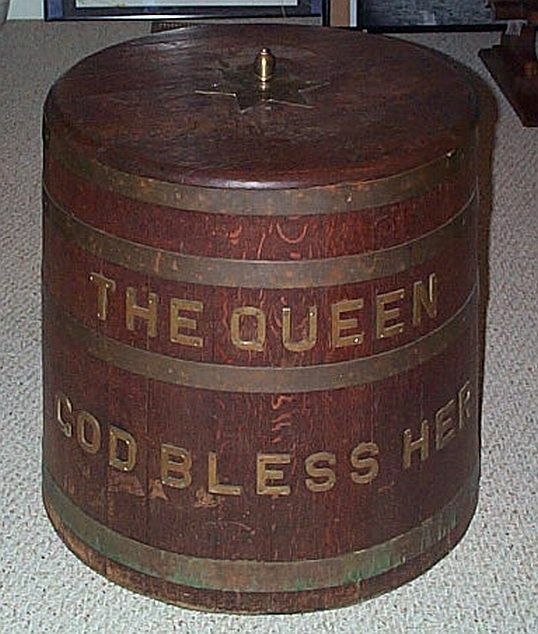 Above photos illustrate the British Royal Navy "Mixing Tub" which is now in the collection of The Pirate's lair and properly entitled in brass lettering "The Queen - God Bless Her" from either the Victorian or Elizabethan era. Note that this mixing tub is huge 30" across at the base by 29" high and weighs almost 100lbs. It is similar in size to the mixing tub as seen in the above photographs shown dispensing grog aboard a battleship ca early 1900s. The photo on right with the two Pirates-To-Be is to show comparitive size and proportionate scale. Click here for more in depth analysis and photos of this British Royal Navy Mixing Tub. 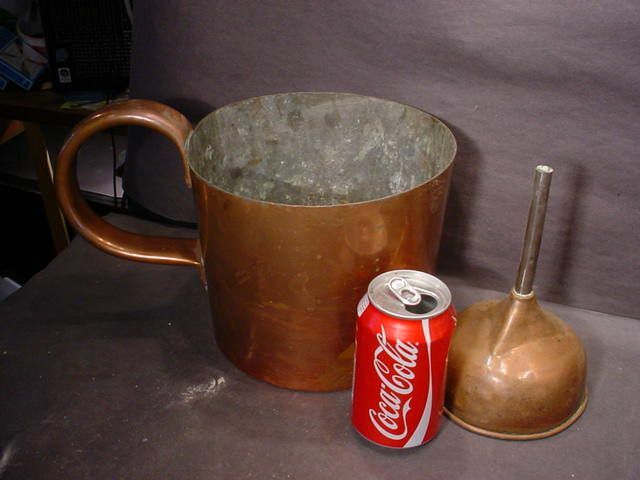 Photo to the left illustrates and compares the One Imperial Gallon copper measure (largest of the eight grog measures), a copper measuring funnel, and a coke can for comparison purposes. 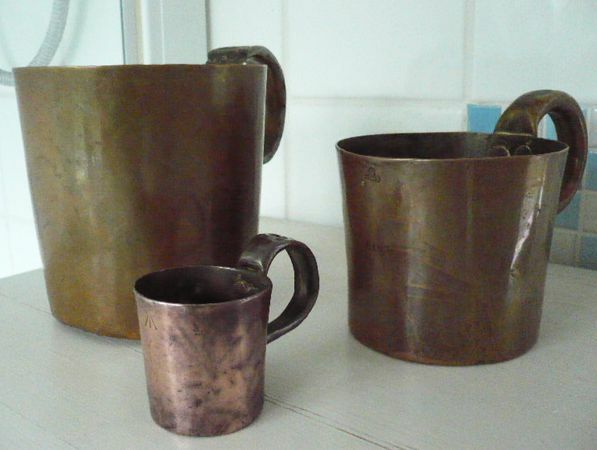 All eight copper measures (or rum cups!) were identically made from the smallest 1/2 Gill to the largest 1 Gallon. In fact some humorously say that the One Gallon was made for "giants" as that is what it appears to be! Photo to the right illustrates and compares an oak rum and grog Mixing Tub or Cask with two copper measuring funnels. What Are Rum Measures or Grog Measures? How Were They Used? How Was Rum or Grog Measured Out? 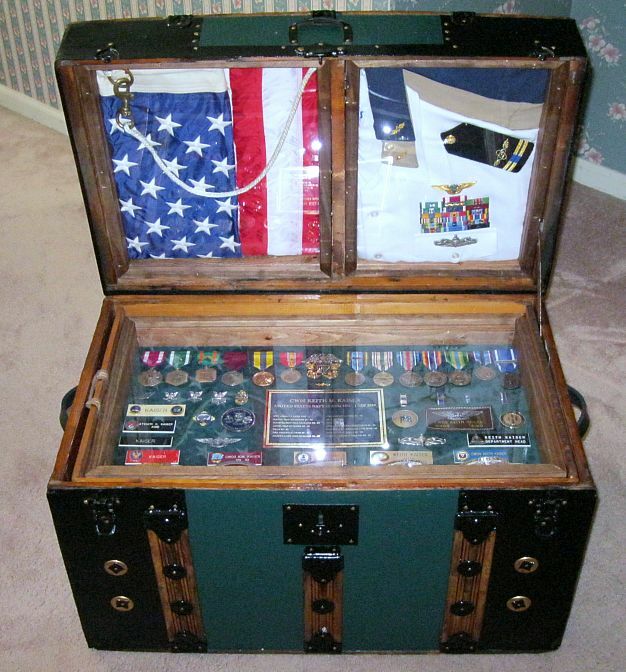 First, many erroneously use the word rum and grog interchangeably when referring to the time honored tradition of serving a daily ration of rum to the enlisted sailor in most 19th century navies of the world. 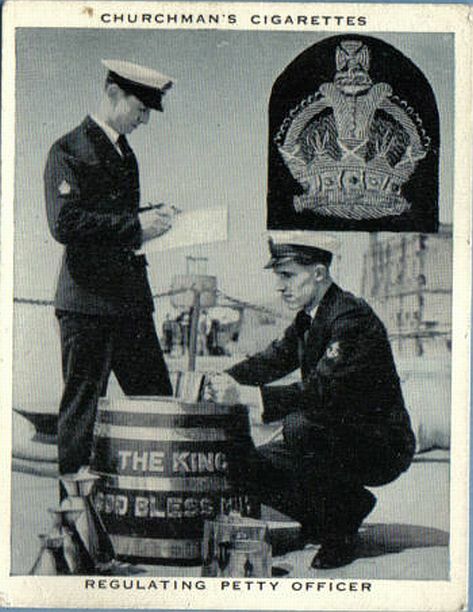 In the British Royal Navy Rum was mixed or diluted with water to make "the grog" which was then measured out and served. This tradition is most associated with the British Royal Navy which ceased this practice in 1970. The Canadian Royal Navy stopped in 1972, the Royal New Zealand Navy stopped in 1990, while the American US Navy stopped this tradition on/about 1865 right after the Civil War. Aboard British Royal Navy veseels in the 18th and 19th centuries the 100+ proof rum was stored in oak wood barrels and later in the 20th century in marked ceramic or porcelain jugs called "demijons" and wrapped in weaved cane to prevent breaking and damage. 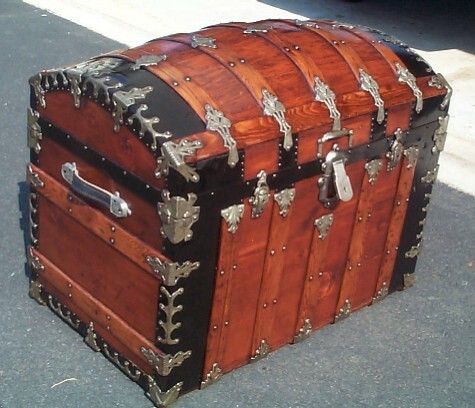 This stored rum was then mixed with water in a 1:3 ration (some say a 1:2 ratio) in a large wooden barrel or smaller portable kegs or casks for mixing/dispensing and was known as a "Grog Tub" or a "Mixing Tub". Sometimes these Grog Tubs were appropriately marked and decorated, sometimes not. 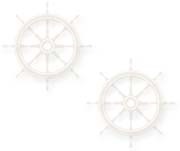 However in most cases you will find a six pointed star which was the insignia representing property belonging to the Royal Navy's Supply Rating along with either "The Queen, God Bless Her" or "The King, God Bless Him" as appropriate for the then reigning monarch. There are eight (8) grog measures in a set: From 1 Imperial Gallon, 1/2 Gallon, 1 Quart, 1 Pint, 1/2 Pint, 1 1/2 Gill, 1 Gill, and Half Gill. 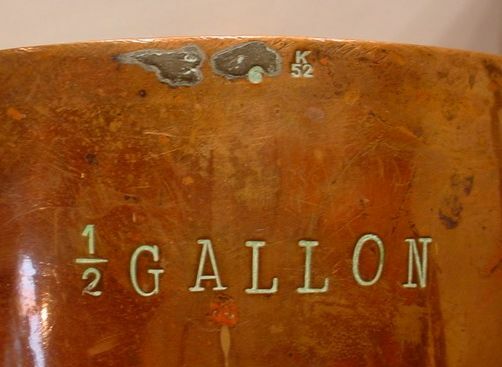 (the 1 1/2 Gill measure only produced in the mid 20th Century not during the Victorian era) An oak mixing tub and the eight rum or grog copper measures are seen in the photo to the left. Example: If the Rum Bosun's mess contained 6 individuals that were entitled to 'draw the tot', then that is 6 x 1 and 1/2 gills of grog, equalling 9 half gills of grog. The Rum Bosun would then receive a 1 pint measure and 1/2 gill measure which would be dipped into the 'grog tub' and then poured into his "rum fanny" to be brought back and served to his mess mates. Also used in the twice daily "ceremonial" process of mixing and distributing rum and grog were small to large mixing tubs with emblazoned "To The Queen (or King) God Bless Her (or Him)", along with an array of copper pumps, specially designed copper funnels, ceramic demijons covered in wicker, iron or tin rum fannies and pails, copper lipped pitchers were also used in the mixing and distribution of rum and grog aboard ship, along with the more famous "rum cups". 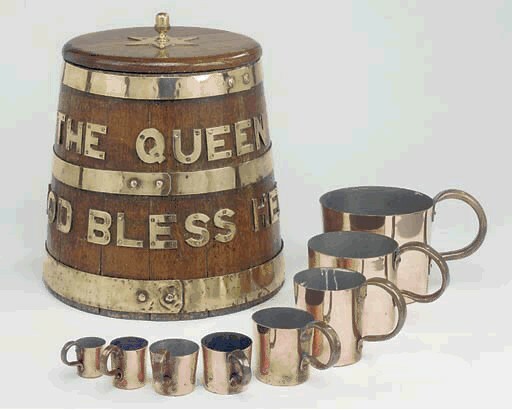 Click Here For Price and Availability of Authentic 19th 20th Century Royal Navy Rum Cups or Measures, Rum Fannies, Lipped Measures, Funnels, Mess Pails or Mess Buckets, Wooden Water/Rum/Grog Mixing Tubsor Casks. Above photos show a collection of British Royal Navy Rum Cups or Grog Measures (or Cups) - 1 Quart, 1 Pint and 2 1/2 Pint Measures. Above photos show a collection of British Royal Navy Grog Measures in 1 Quart, 1 Pint and the RARE 1/2 gill Measure! In general each dispensing Grog Measure was made to very specific British Government standards and Royal Navy specifications since each sailor had his eye on his "daily tot" or rum ration and would not countenance any shortings by improperly made or sized measures! 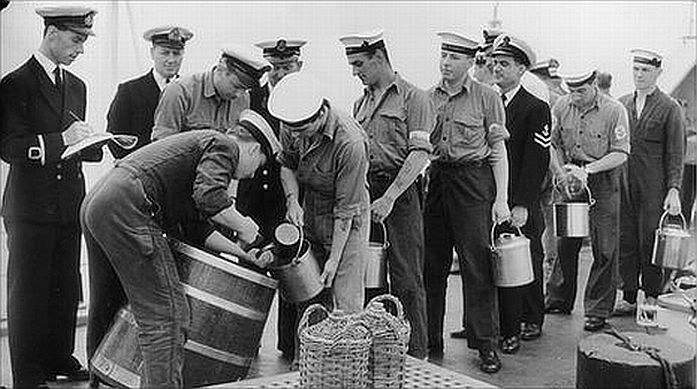 This being said the British Royal Navy rum itself, how and where it was produced; the ratio of rum-to-water in mixing the grog; and the actual official measuring of the grog from the "Mess" down to the individual sailor was a very formal process and a daily tradition taken very seriously by all hands. Towards that end the seven grog measuring cups (or "measures" as they were called) stayed pretty much the same from the early/mid 19th century Victorian-age through to the mid 20th century when the tradition of the daily tot was abolished. 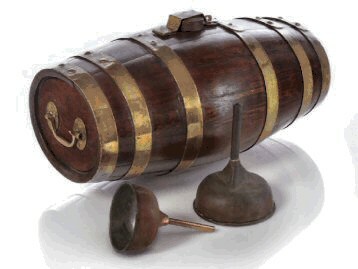 As with most British military and Royal Navy equipment the Grog Measures were mostly (but not always) similarly stamped with various and changing Royal Ciphers even under the same reigning king or queen, Government Approval, Inspection and In-Service Property Stamps, and Measure Size. Some of these markings included broad arrows or sometimes known as crows feet, crowns with numbers, monograms of VR or GR for Victoria Regia or George Rex, 19th or 20th century scripted letters, P's or G's denoting Government Proof and Government. In many cases the markings on these grog measures are now faint, sometimes though rarely completely non-existent due to past daily use, cleanings, and polishings over a 100 years or more! 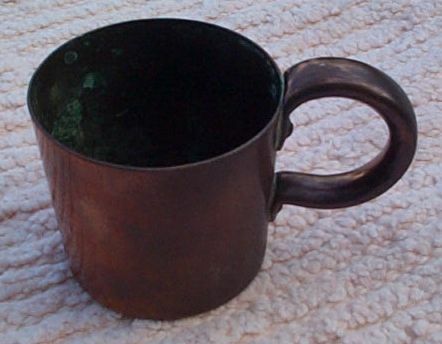 Each and every Rum Cup or more accurately Grog Measure consisted of all copper construction with tin lining inside. Always with riveted handle, two rivets securing the top and one rivet securing the bottom part of the handle onto the cup body. 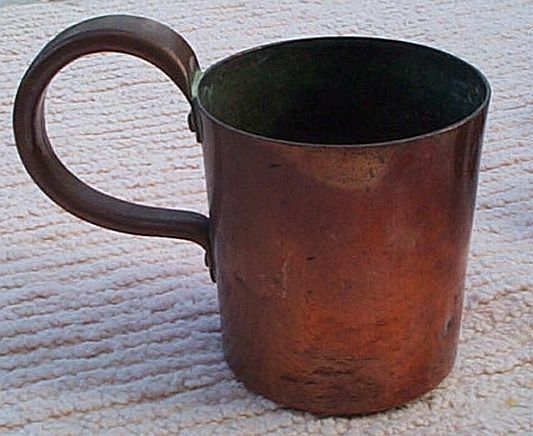 Each handle was made of a copper rectangle which was then folded over to form a squarish roundish length with the joining seam on one side which faced towards the cup when secured with the rivets. 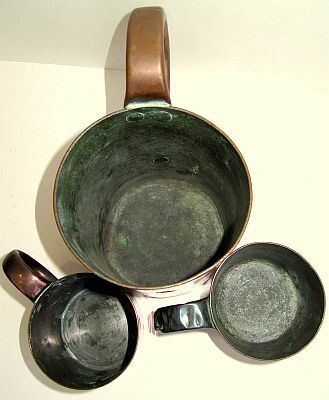 In all older Victorian-era (1840s-1860s) copper measures the cup portion was made up of two pieces of copper, one for the rounded body and another for the bottom. These two pieces were then hammered/soldered to form a watertight and durable seal. 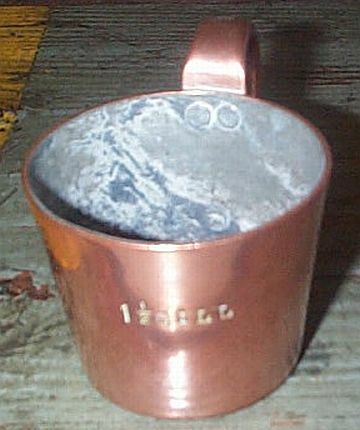 One can still see the standard jagged squarish outline found on all of these earlier model grog measures where the bottom piece was mated to the cup body. This is an excellent way in helping to determine the age of authentic Royal Navy Rum and Grog cups. 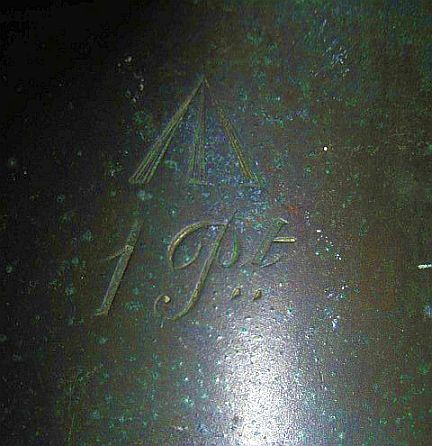 As far as we can tell there were no "round" or flat square sheet-metal handles on any authentic grog measure produced for or by the British Government. 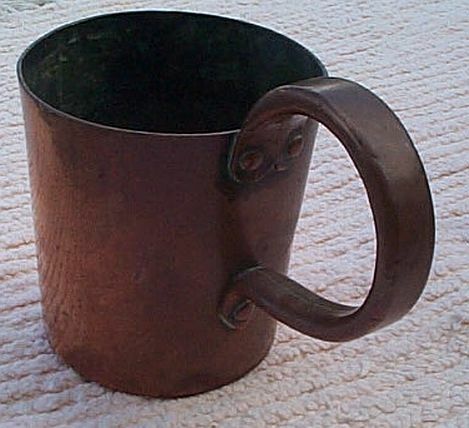 Additionally, we have never seen an authentic Royal Navy copper rum cup or measure without the handle being riveted onto the cup, two rivets up, one down. 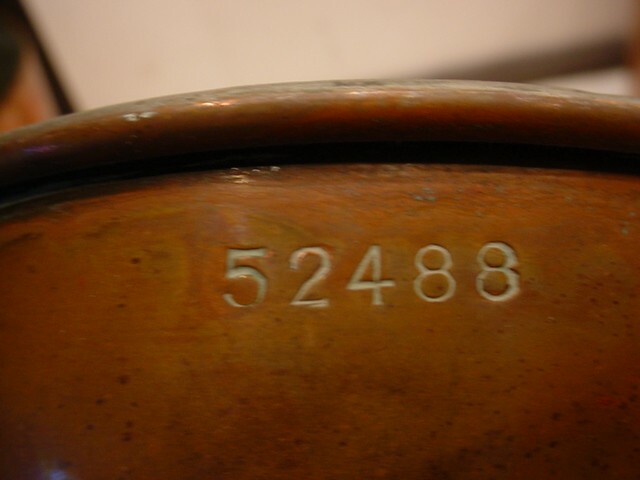 Again, it is the purpose of this web page to provide the reader with steadfast historically accurate information with photo documentation as evidencing the many and varied types of official marks and stamps as found on legitimate authentic rum tubs, rum fannies, and grog measures. 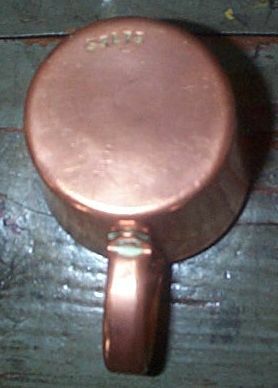 The 1 Imperial Gallon Copper Measure "Rum Cup" or "Grog Measure" is the largest of the 8 Cups which make up a complete set. Above to the left you will find a comparison of a 1 Imperial Gallon Rum Cup alongside a coke can for comparison and perspective. 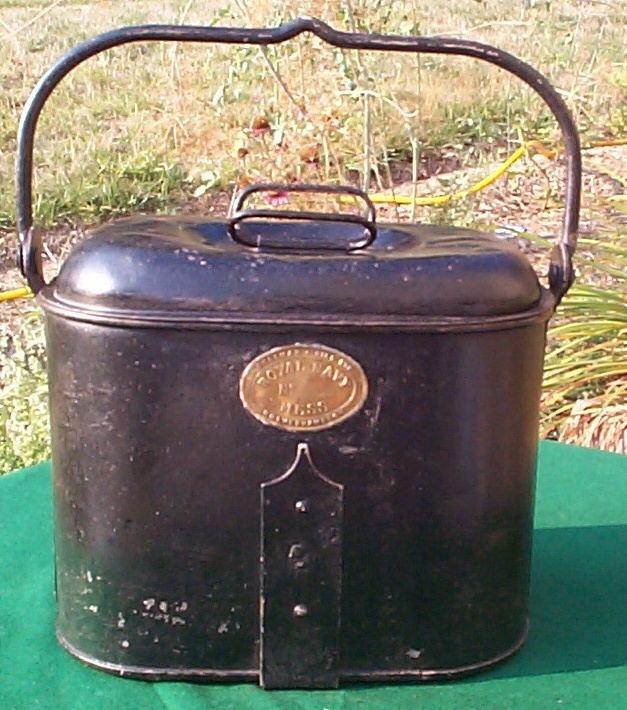 Photo on the right illustrates a standard 1 Gallon Measure. Note the Victorian abbreviated italic measure and the post-production field-stamped ownership of "No. II GALLEY" ensuring that this certainly was in-service aboard ship. 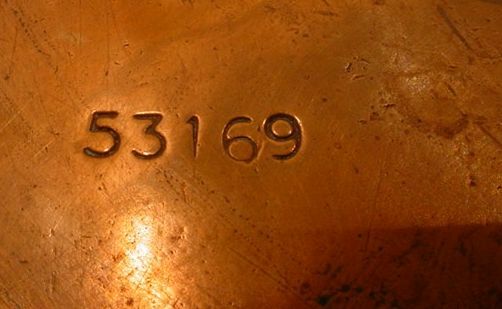 Note the above part numbers stamped on two different 1 Gallon Royal Navy Grog or Rum Copper Measures or Cups! As the Royal Navy's supply department became more modernized and centralized (read computerized!) on/about the 1960s all equipment used in the Naval Sea Service needed to have part numbers associated with them, even the Rum Cups. 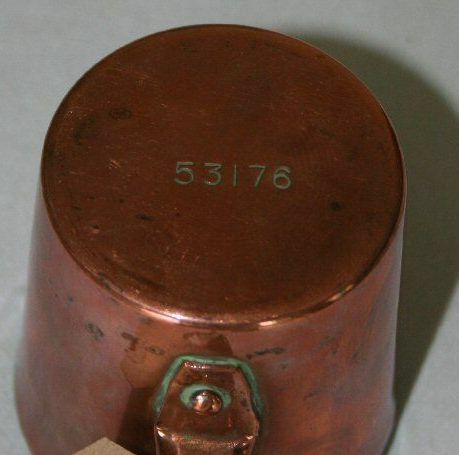 The p/n for a 1 Imperial Gallon copper measure was 53169! To the left you will see both a 1 Gallon and 1/2 Gallon Copper Measure for comparison purposes as well as two funnels used during the twice daily "Up Spirits" ceremony in mixing, serving, and distributing the rum and grog mixture to the enlisted ratings aboard British War ships. To the right is a mid 20th century stamped 1/2 gallon measure, and not the blurred royal cipher yet clear government stamp indicated where the measure was manufactured. 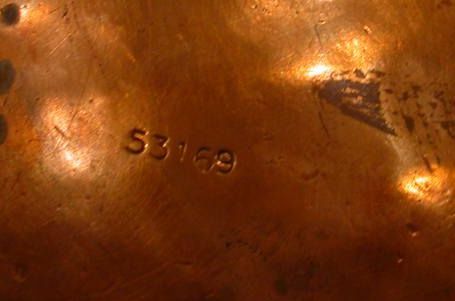 The part number 53170 shown to the left helps not only to identify this is a half gallon copper measure, but also helps to provide both provenance and estimated date of manufacture of mid 20th Century. 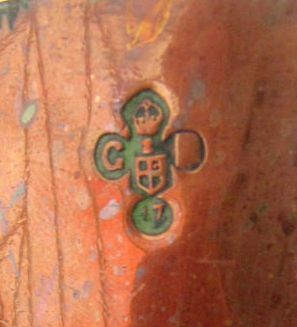 Above is a semi cleaned and polished 1 quart copper grog or rum measure that has a George V Cipher stamp and "GR" monogram (a Crown above a Heraldic Shield with monogram initials G on left and R on right side of the Shield, with the numeral 17 beneath. In between the crown and heraldic shield is a roman numeral V which looks like a bit like a Z as the left leg of the V is very faint). 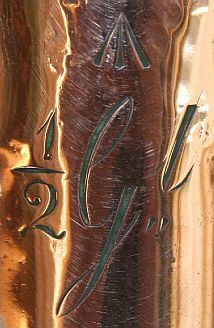 This particular Royal Cipher makes the production and use of this 1 Quart measure early-mid 20th century when King George V was the reigning monarch. The Quart measurements are 5" high and 4.5" wide at the brim. 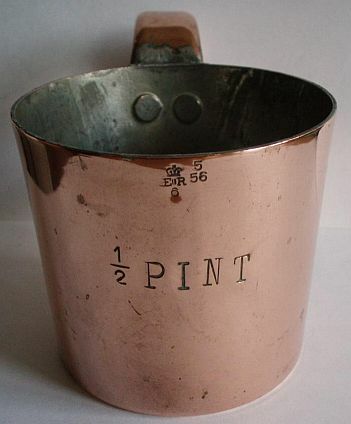 Note however the exact same general design used in this mid-20th century 1 Quart measure and the first presented 1 Pint measure that was produced in the mid-late 19th century - 50 to 100+ year span of time and same design! 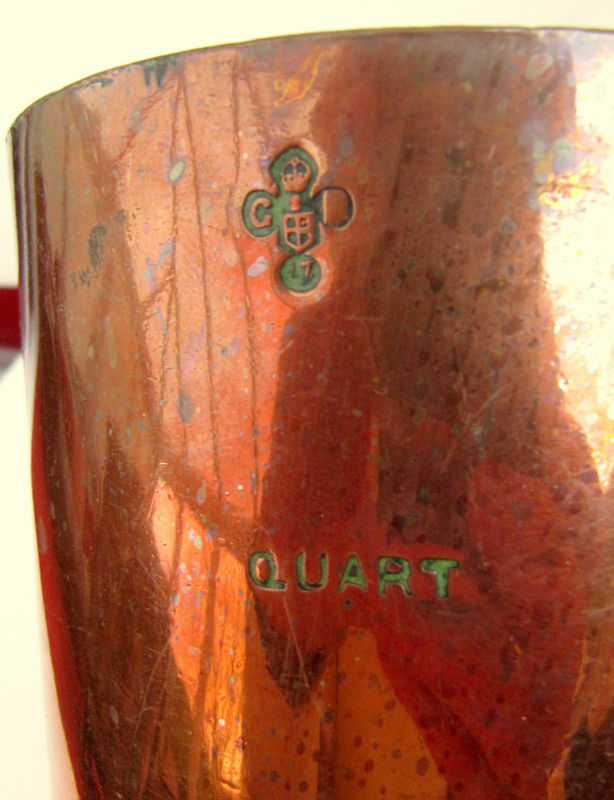 Above is a closeup of the George V Cipher government stamp and stamped "quart" using modern day 20th century text font and pitch as found on the 1 Quart measure. The George V cipher is as follows: the Royal Crown above a Heraldic Shield. The the left and right of the Shield are the letters "G" and "R" representing George Rex and in between them is the barely recognizable roman numeral "V". Below the Shield is the number "17" representing the Inspector who proofed this item for Government In-Service Property, and the place/city of manufacture. It has been conveyed to us by knowledgeable sources that the monogram "GR" and numeral "17" is the mark for Renfrew County and was used from 1879 onward. 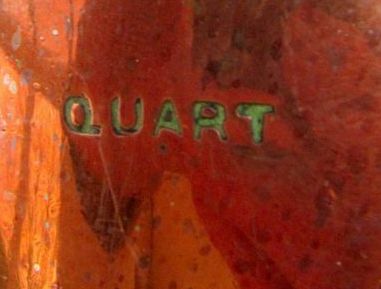 Note also that the word QUART is in the "block" text with a 20th century font and pitch style to the letters or characters. 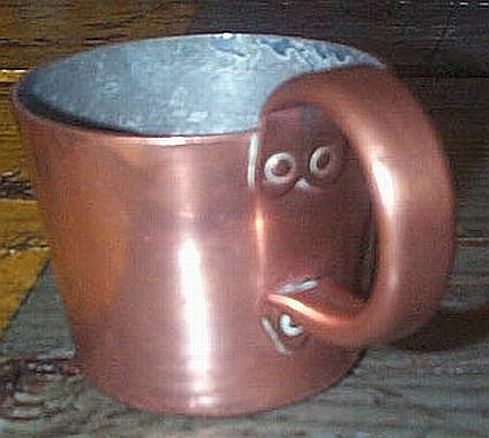 Note the location and number of rivets holding the "squarish" handle of the cup onto the body. Again, we have never seen authentic grog or rum measures ever not use rivets in this design to secure a handle. Many reproductions just use soldering with round handles. 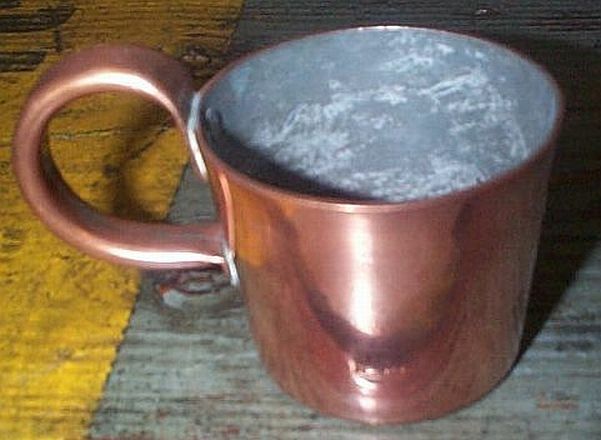 Additionally, the squarish made handle of all rum or grog measuring cups from the largest 1 Imperial Gallon to the smallest 1/2 gill always used riveted handles made of folded over copper sheets with the seam being seen on the inside. Again, we have never seen just plain round handles. Above is a 19th century 1 Quart Grog Measure in our collection which has been highly polished and has clear Queen Victoria Cipher stamp "crown over VR6" indicating that it was produced in Birmingham and used during her reign as Queen, and a "Broad Arrow" which indicates that it was properly inspected or proofed as British Government In-service Property. Note that the text indicating the measures size ("Qt") being used is "Abbreviated Italic Script" in the standard 19th century pitch and font style of the letters or characters. In our collection is an unmarked though authentic early Queen Victoria-era mid 19th Century 1 Quart Rum or Grog Measure that is available and for sale which can be seen and purchased by clicking the below link. 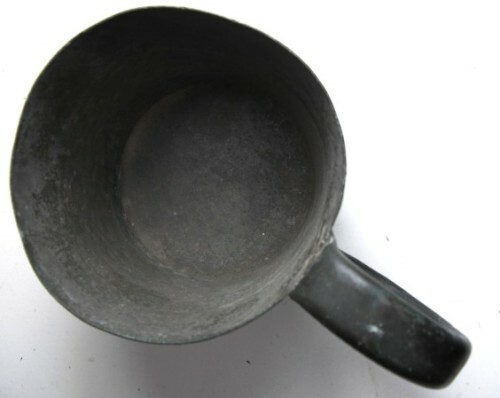 Authenticity for this grog measure was determined exclusively by the very specific construction method, the handle, and especially the two-part cup body. 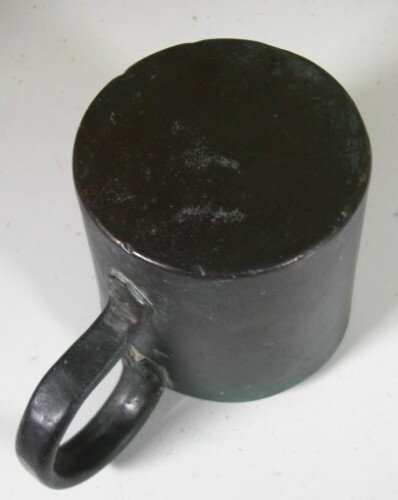 Above photo represents an authentic unpolished 19th Century Victorian-era British Royal Navy 1 Pint Grog Measure showing the standard riveted handle with inside seam. Note that the handle is of a more "squarish" design as opposed to being solid and round. While there may or may not have been soldering used when securing the handle to the cup, all authentic grog measures will have two rivets securing the top of the handle and one rivet below. 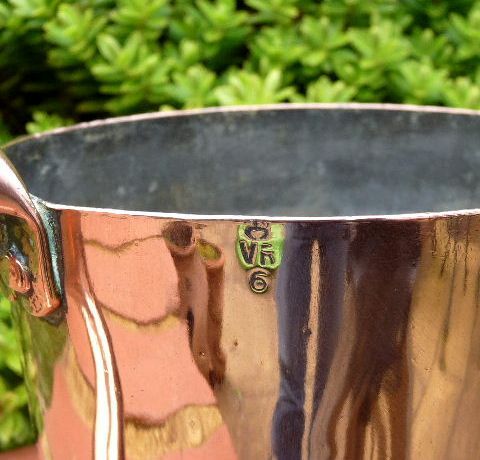 We have never seen an authentic British Royal Navy Rum Cup ever have anything but this standard rivet design to secure the handles to the cup, as opposed to the more modern day contemporary welding only found on reproductions. 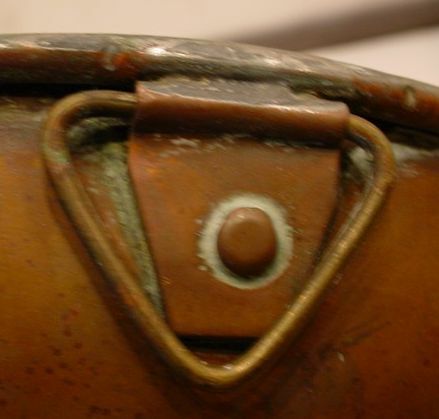 Also note how both the inside tin lining and outside copper patina of this grog measure have oxidized making both look the same. 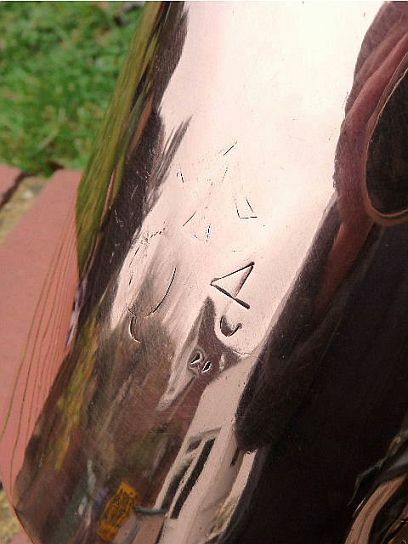 This is what a typical British Royal Navy Grog Measure should look like after having not been polished or cleaned for close to a century or more! The above 1 Pint is the real deal and a perfect specimen by which all comparisons of British Royal Navy rum cups or grog measures produced in the 19th century Victorian era can be made. 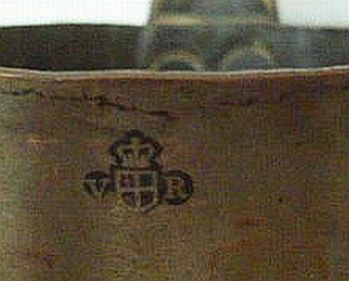 The royal cipher "Crown over VR 6" indicates that this cup was made at Birmingham ca 1876. The 1 Pint measurements are 3.75" high and 3.75" wide at the brim. 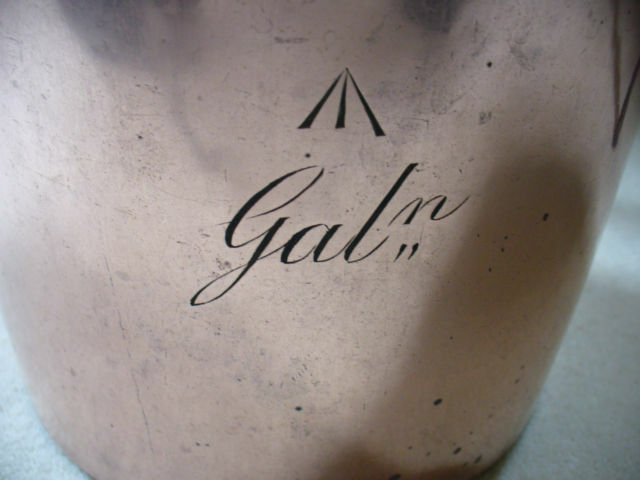 It should also be noted that this grog measure uses the 19th century "Abbreviated Italic Script" in identifying it as a 1 Pint measure. Photo to the Left. Note the Broad Arrow also known as a 'crows foot' which signifies it was government property and proofed ready for government or naval service. The "1 Pt" is of course signifying a 1 Pint measure with scripted font and pitch style used in the 19th century. 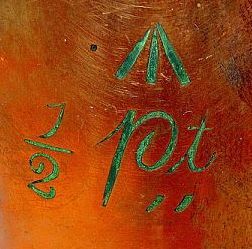 Strictly speaking if this rum measure was taken out of service due to damage another Broad Arrow mark would have been stamped point-to-point with the first Arrow. 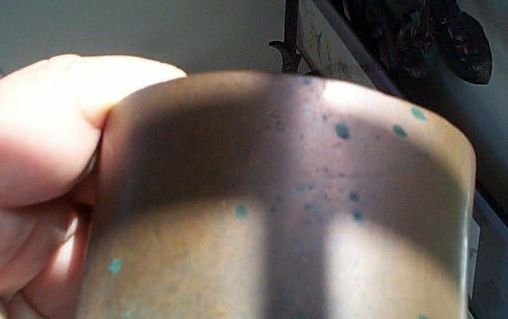 In this closeup photo one can readily see that overall dark greenish-mahogany of the aging patina of the cup along with lighter flecks of greenish-blue from the oxidation of the copper. Photo to the Right. Note the rudimentary Royal Crown, the VR below it, and numeral 6 below that. This signifies that this cup was made for the British Royal Government under Queen Victoria's rule (VR=Victoria Regia) between 1837-1902 and Royal Inspector #6 performed the inspection and proofing at Birmingham, England ca 1876 where the cup was originally produced. Also of note there are no bottom marks, arsenal or manufacturer. We have been told by an expert in the field that bottom marks and manufacturing stamps can be found on post-Victoria mid 20th century rum or grog measures. 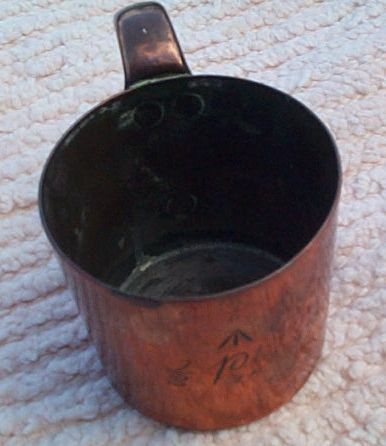 Above photos show a semi cleaned and polished 1/2 Pint copper measure with the classic design and style as found on both the 1 Pint and 1 Quart measures previously illustrated. Like the others it is copper with tinned inside. 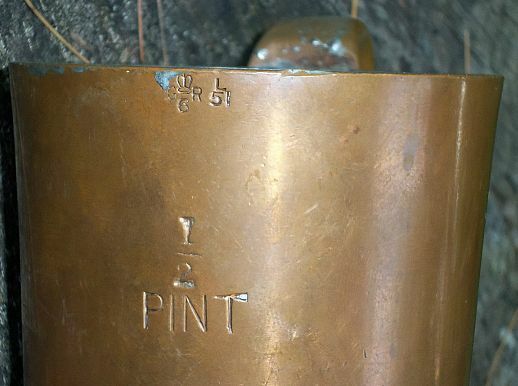 As you will see below this measure sports a Queen Victoria Cipher, and Government In-Service Property Arrow Stamp (or 'crows foot') which makes the provenance of this grog measure, like the above 1 Pint measure, between 1837-1901. The 1/2 Pint measurements are 2.75" high and 3" wide at the brim. 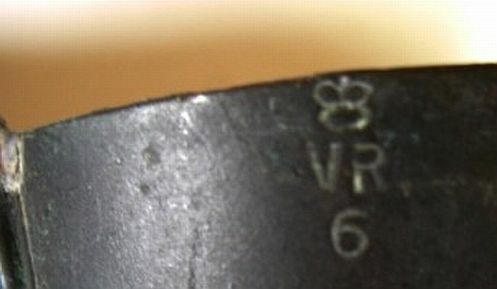 Note the Victorian-era cipher similar to the 1 Pint measure previously illustrated (produced in Birmingham ca 1876), but on this measure the Royal Crown, letters VR for Victoria Regia, and the numeral 6 are encircled, produced in Birmingham ca 1876. This particular 1/2 Pint measure also has a "G" below the royal cipher which we believe is a British Government proofmark, and "G" standing for Government. Also note the 19th century text font and pitch being used indicating the size of the measure, "1/2 Pt". Additionally the measure is clearly marked with a Broad Arrow indicating it is British Government property and in service. Note that the text indicating the measures size ("1/2 Pt") being used is "Abbreviated Italic Script" in the standard 19th century pitch and font style of the letters or characters. 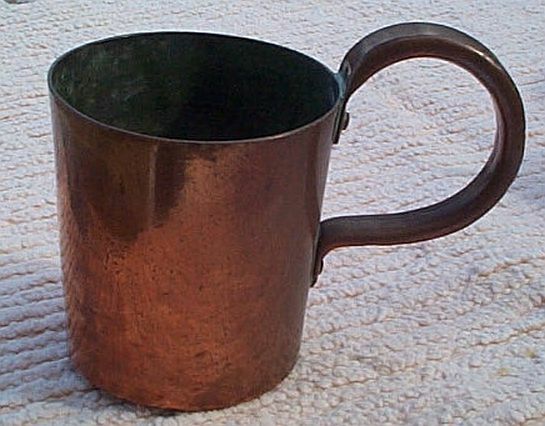 Again note the three rivets and location attaching the handle to the base of the cup on this 1/2 Pint measure, and the thick handle itself made of a folded over copper rectangle strip just like the previously illustrated 1 Quart and 1 Pint measures. 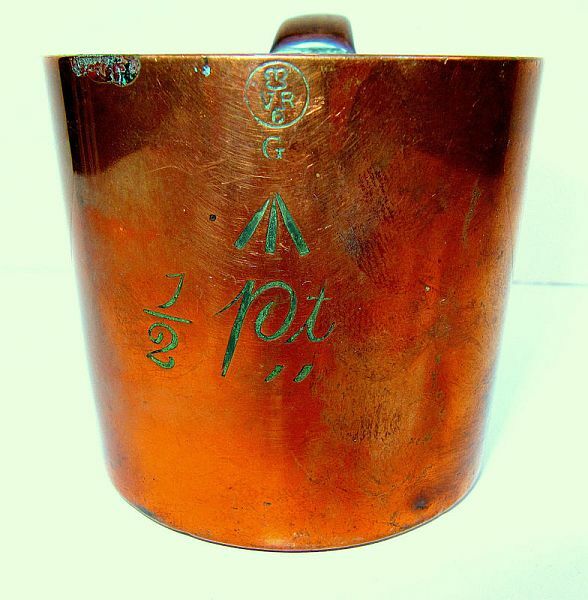 Photo to the left and above show another 1/2 Pint Grog Measure only with the faint numeral "2" and the numeral "0" or letter "C" just below it left showing on the front of the cup. 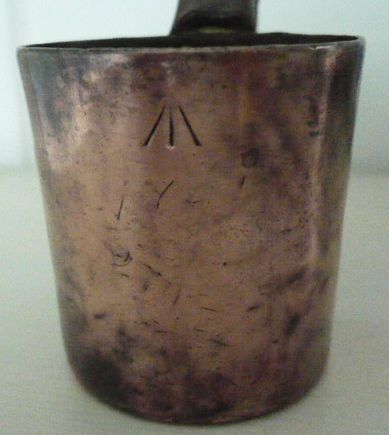 It is unclear whether this is a 19th or 20th century produced 1/2 Pint measure and the only certain way is to find another measure with clearer markings which match to the remnant markings shown on this cup. This particular 1/2 Pint Rum or Grog Measure is available and for sale and can be seen and purchased by clicking the below link. 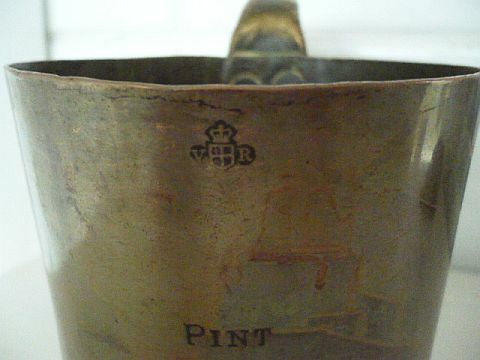 Above photos represent a mid-late 20th century 1/2 Pint grog cup marked with the royal cipher of GRV - Crown over GR with another G beneath and L over 51. 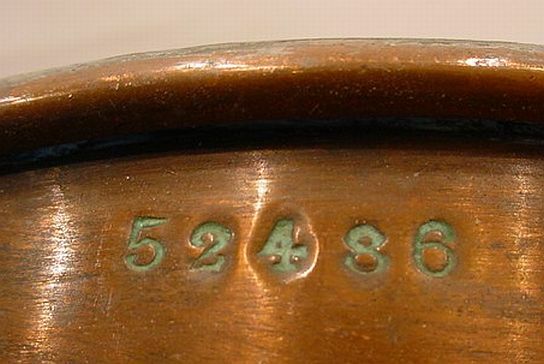 The bottom of this 1/2 Pint cup has a stamped inventory or serial number of sorts marked post-production ("53173") which we believe began after 1907 when the British Royal Navy went from an individualized mess to a the centralized or general mess. 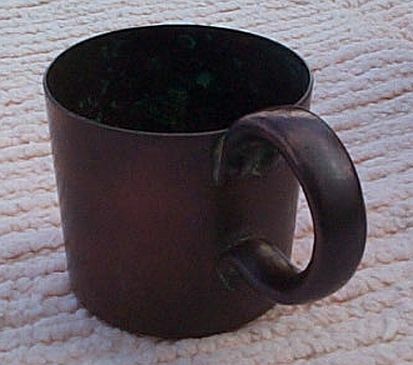 This particular rum cup appears to have been produced in the mid 20th century. 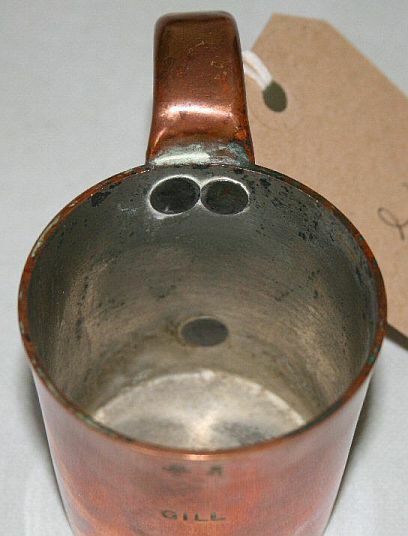 This particular rum cup is in a RARE absolute perfect USABLE condition with no leaks and the inside tinning intact! The above 1/2 Pint Rum Cup has the Royal Cipher of Queen Elizabeth II with a production date of 1956. Since the British Naval tradition of the "daily tot" was discontinued in 1970 over 30 years ago no official rum cups were made afterwards which now makes them scarce and valuable. However rum cups with the Queen Elizabeths Royal Cipher are even rarer and more sought after as she is the current British Monarch and not many official rum cups were made during her reign. 1 and 1/2 Gill MEASURE p/n 53175 - RARE! 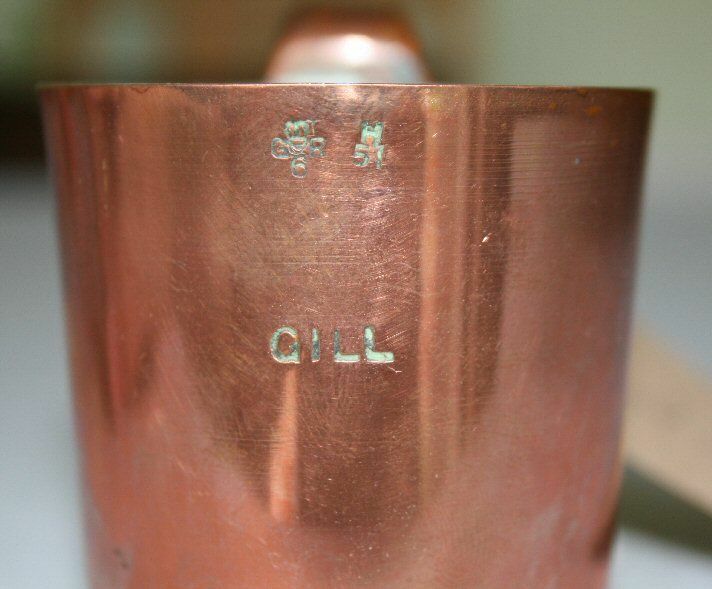 The above 1 and 1/2 Gill Rum Cup has no Royal Cipher or Markings other than the size and on the bottom the part number or Royal Navy Supply inventory number 53175.. It is believed that the 1.5 or 1 and 1/2 gill cup was first introduced in the early to mid 20th century, and very few if any authentic cups have been found with Queen Victorian 19th Century Ciphers. 1 Gill MEASURE p/n 53176 - RARE! 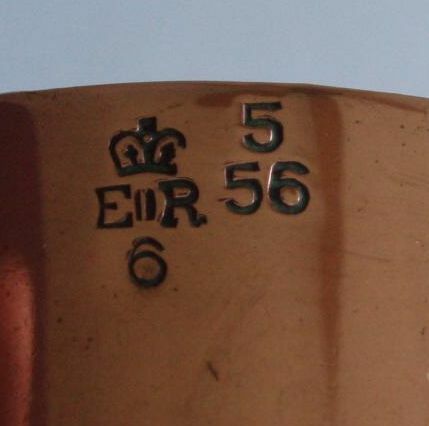 The above 1 Gill Rum Cup has a 20th Century Royal Cipher of King George V and Inspection Markings as well as the part number or Royal Navy Supply inventory number 53176 stamped on the bottom. 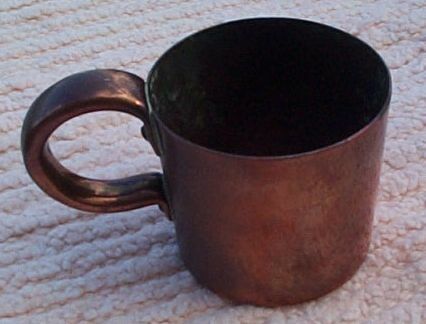 The One Gill Rum Cup was used throughout the Victorian 19th Century and thru the 20th Century until the ending of this naval tradition in 1970. The above photos and to the left show the smallest and rarest of rum or grog measure, the 1/2 gill which has been semi cleaned and polished! The volume of this 1/2 gill has been tested and it took 8 of these measures to fill a 1 Pint measure. Note again the same design form as the much larger 1 Quart, 1 Pint and 1/2 Pint measures already illustrated. Note also the number and placement of the securing rivets seen in the photo to the right - 2 top and 1 bottom just like all of the other measures - no deviation, this was standard! The 1/2 gill measurements are 1 7/8" high and 1 7/8" wide at the brim. The above government marks and stamps have been worn with age and use, but appear to be of "Victorian-era" pitch and font. Since we have many known examples of rum and grog measures in hand we can begin to decipher the stamps that have survived and those that appear to be missing but can be expected to have had. And as with all of our antiques we have taken a magnifying glass to thoroughly go over every part of this 1/2 gill cup attemtping to pick up the smallest traces and nuance left to further help and aid to identify and date this item. First is the broad arrow located on the cups front top. This is exactly the type of broad arrow used in the 19th century, and right below that are faint remnants of some text. We know that this is a 1/2 gill Measure, and also know that somewhere on the front of this cup should be the measures size in plain text. We have plenty of examples of both antique 19th century style and more contemporary 20th century style fonts and pitch. We know from experience that the size measure in text should read "1/2 gill" with perhaps the 1 being placed directly or almost directly over the 2. And most likely it will be in 19th century style, pitch and font as found on other measures. One can see in the photo to the left that a numeral "1" can be discerned with perhaps a faint outline of a "2" just beneath it. To the right of the numeral "1" is some text which should be "gill" (or "GL") and one can faintly see the italic letter "G" and the abbreviated italic letter "L". And just to the right of the numeral "2" appears to be a "-" or dash that would typically be seen below the second letter which would also be consistent with Victorian-era markings. In the final analysis we believe that this is a 1/2 gill measure with Abbreviated Italic Text and was produced during the reign of Queen Victoria - ca 1837-1901 - with a most likely production date of late 1870s-1890s. 19th and 20th Century Royal Ciphers, Identifying Text, Character Font and Pitch Type Used To Mark the Measures! 19th Century Victorian-era Abbreviated Italic Script, 19th Century Full Italic Script, 19th Century Block, and 20th Century Block - photographic examples of each will be found below. We have been able to identify the general era of the text by the following two Royal Ciphers, ie; VR=Queen Victoria 1837-1901, GRV=King George 5th 1911-1936. So far we have not seen other royal ciphers and below are some samples of royal ciphers used. Photo to the LEFT illustrates a 19th Century Victorian Era cipher consisting of a rather plain crown above the initials VR. Queen Victoria's reign was between 1837 and 1901. Photo to the RIGHT illustrates another 19th Century Victorian Era cipher consisting of a Heraldic Shield with the initials VR on either side. crown above the initials VR. Photo to the LEFT illustrates a 20th Century George V Era royal cipher consisting of a Crown above a Heraldic Shield with the the initials GR to either side and a very small roman numeral V (looks like a Z or a 1). George V's reign was in the latter part of the 20th century, 1910-1936. The Royal Ciphers are critical in firmly establishing vintage and provenance, however the type of text used in identifying the measure and specifically the type of font and pitch of the letters used can also help in determining both age and provenance. It should be noted that many rum or grog measures only have very faint markings remaining because it was the practice to keep them highly polished at all times, and repeated polishings over decades or a century of use tended to rub off the markings. Also measures that have dents, been knocked around or show repairs most certainly were heavily used during their service life. There is also a very distinct difference between the type of font and pitch used during the 19th and 20th centuries, along with the style of the text which we will illustrate below, the three main types are: "Block", "Italic Script" and "Abbreviated Italic Script". These differences in style, font and pitch can also determine age and provenance when a royal cipher is not present due to repeated polishing or damage while the measure was in service. Above two photos show what is termed as "Abbreviated Italic Script" Style in that the measure size is not fully spelled out, but abbreviated in a scripted text. In this case 1/2 Gallon and 1/2 Pint are abbreviated to 1/2 Gl and 1/2 Pt. This older type of script style, font and pitch was consistent and used only during the Victorian period. Above photo shows what is termed as "Italic Script" Style in that the measure size is fully spelled out, in this case 1 1/2 Gills. 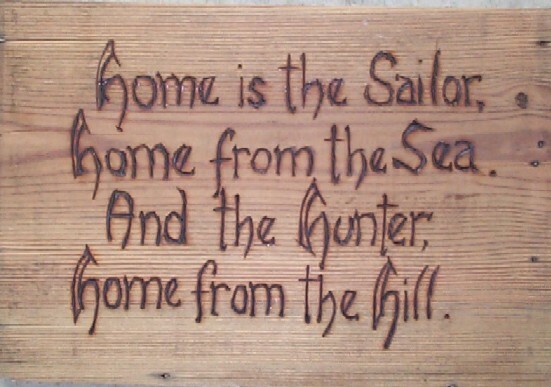 This type of script style, font and pitch is also consistent with and used only during the Victorian period. Differences of character font and pitch between 19th and 20th Century "Block" text. Photo to the left shows what is termed as "Block" text in a 20th century style font and pitch to the letters or characters making up the word QUART. The font and pitch of block text used in the 20th century is very distinct from that used in the 19th century. Note that none of the characters have what is termed as "tails" trailing off of the end of the vertical and horizontal strokes that make up the letters. 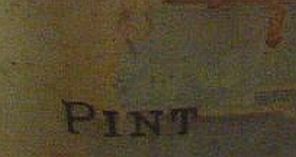 Photo to the right shows what is termed as "Block" text in a 19th century style font and pitch to the letters or characters making up the word PINT; note the "tails" that are at the end of all of the vertical and horizontal strokes that make up the letters. Compare the "T" in both photos and see the differences in each. 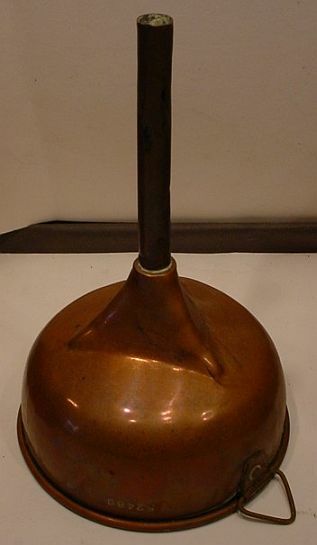 The regulation British Royal Navy Rum or Spirit Pump p/n 53598 consisted of a 41" long copper tube body and reservoir with a wooden handled brass siphon with leather washer to create the suction. 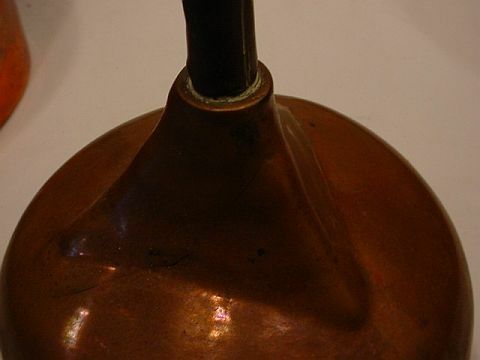 A relatively simple yet effective pump and used aboard large ships-of-the-line throughout the mid 19th to mid 20th centuries and was essential in dispensing the grog! Here at The Pirates Lair we have been fortunate enough in obtaining as part of our collection an 19th century pump which was fully restored and reconditioned for service us by the British Royal Navys "Victualling Department" located at Gosport, Portsmouth, England just prior to the ending of this 400 year old custom. Click Here For More Photos and Information on Royal Navy Spirit Pumps. 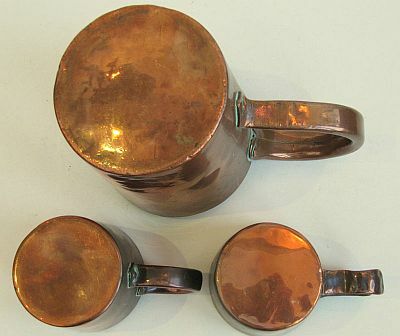 Photograph to the RIGHT compares and illustrates two copper measures or rum cups and 2 copper funnels, a 1 quart and a 1 pint. Photo to the LEFT shows a 1 pint funnel. 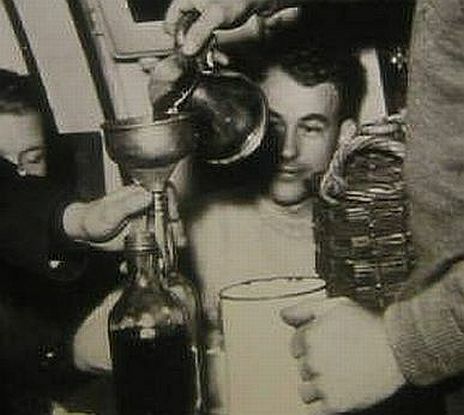 Above photos illustrate the mixing of Royal Navy Rum into a grog mixture and then using a funnel to pour the grog into bottles for serving to the crew. Note the wicker covered ceramic demijon used to store the pure rum, the lipped copper measure which looks like a pitcher being used to pour the grog into the bottle using the copper funnel! 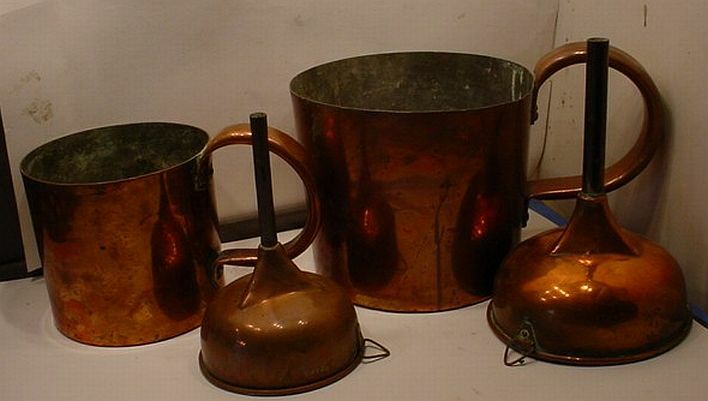 Copper funnels came in approximately 5 sizes: Gallon, Half Gallon, 1 Quart, 1 Pint and 1 Gill. 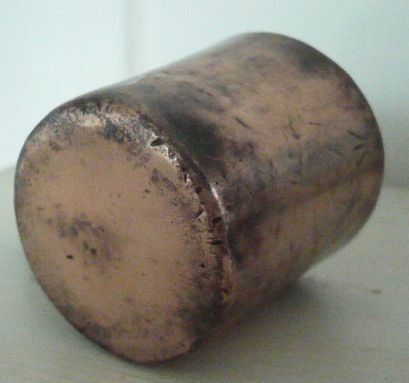 And just like the copper measures they were all manufactured to the same very specific characteristics, ie; tinned copper interior, spout terminating into a square which then turned round, a riveted holder, and they were all able to fit into each other for secure storage! And just like the more contemporary mid-20th century copper measures these funnels also had specific part numbers assigned to them. 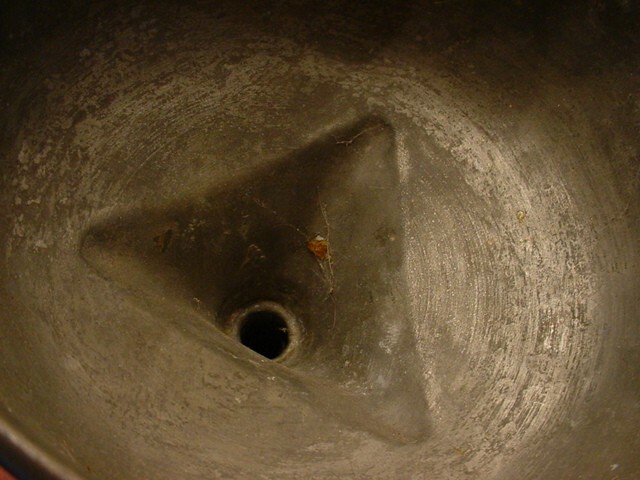 The above funnel stamped with the p/n 52488 indicates that it is a 1 Pint funnel. 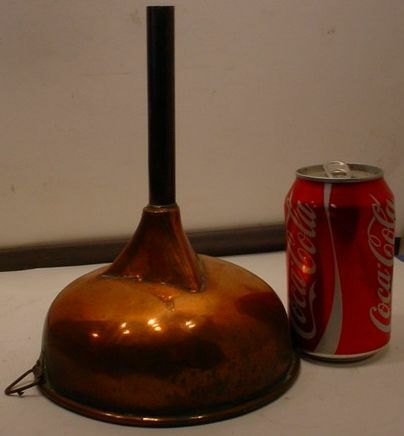 Comparison photo of a 1 Quart copper funnel with a Coke can, and stamped with the p/n 52486 indicates that it is a 1 Quart copper funnel. 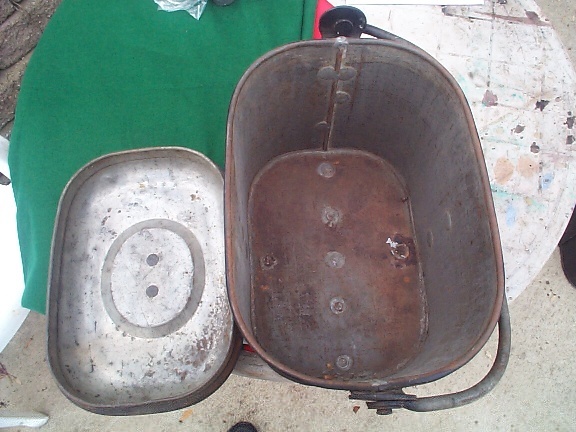 Above photo shows both the exterior and interior of a rum fanny or mess bucket used by the British Royal Navy from the late 19th thru early 20th century. The Navy Mess No badge is semi blackened on one and in original clear brass on the other. From period photographs it appears that the exterior of the rum fanny was not necessarilly painted black but left unpainted in the original iron. However at some time the regulations must have changed authorizing the "black japanning" of the exterior for protection while leaving the inside bare metal. 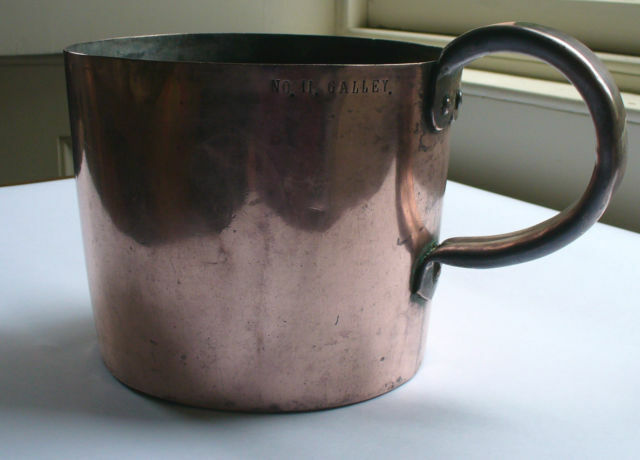 Also of note is that the manufacturer of the the rum fanny or mess bucket was substantial and held together with stout rivets, just like the copper measures! These buckets like the cups were made to last. Both pails are clearly marked on the side medallion "Sellman & Hill, Ltd, Royal Navy No___ Mess, Wolverhampton". On the lid there is another medallion or tag simply "No______ Mess". Note the British sailors standing in line to get their fannies filled! (weg) They are carrying these very same type of mess pails or "rum fannies" illustrated in the photo above while standing in the rum line waiting for their grog! 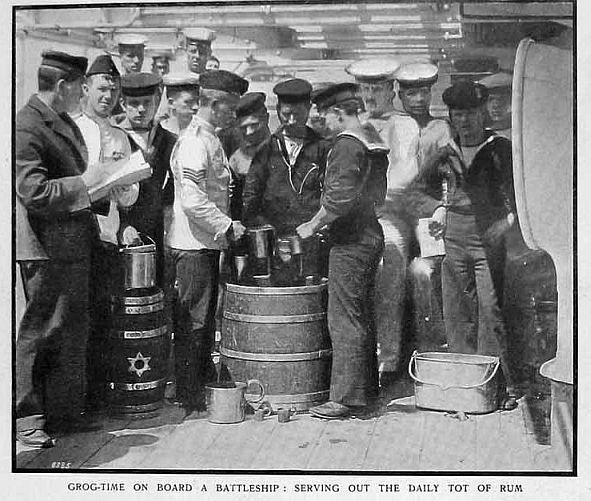 Also note the boatswains mate measuring out the grog at the mixing barrel, he appears to be holding a 1 gallon and 1 quart copper measure! The HMS Renown, 1906. Above left is a ca 1940s BRNIR (British Royal Navy Imperial Rum) demijon ceramic jar encased in weaved cane which held pure british royal navy rum prior to mixing it into grog. 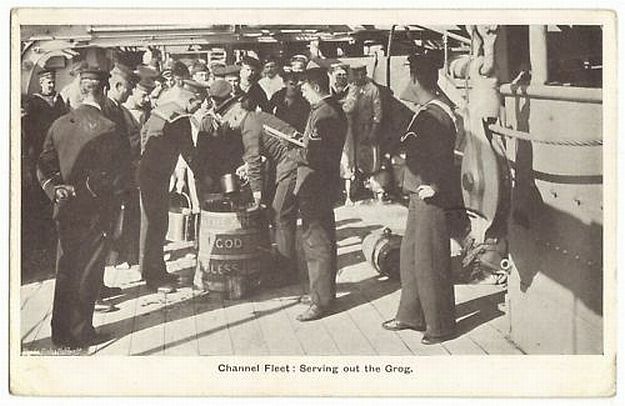 Above right is aboard a British Royal Navy ship dispensing grog to the crew. Note the Mixing Tub with Pump, Grog or Mess Pails, Grog Copper Measures and the Demijons which held the pure rum mixed with water and lime juice to make the grog. 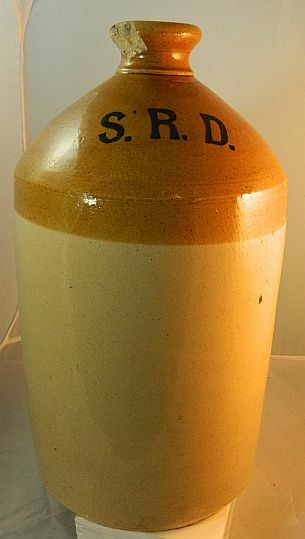 Some of the ceramic demijon jars were found to have the initials "S.R.D." (Supply Reserve Depot) stenciled onto the jars. Some had manufacturer names, while others did not. Some anecdotal stories tell of differences between the wicker used during the early part of the 20th century or WWI in that the wicker used was cut thicker than that found around the 1940s during WWII and thereafter. 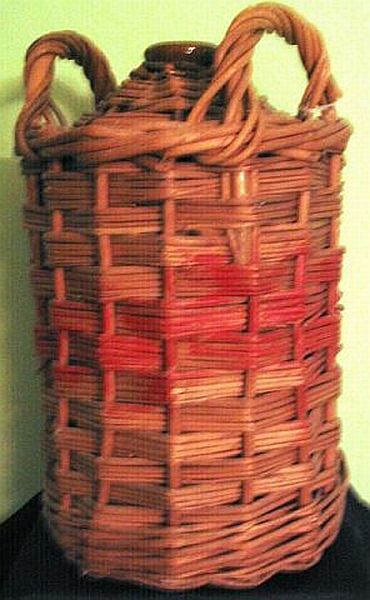 Some of the wicker had red paint around the circumference while some did not. The photo to the left shows a demijon with a painted red stripe around the wicker. While only in black and white the photo to the right shows two wicker demijons with the one further to the right appearing to have a red stripe shown in a darker gray stripe while the demijon on the left shows no darker gray stripe. Photos to the left and above illustrate a demijon with its wicker removed showing the initials S.R.D. 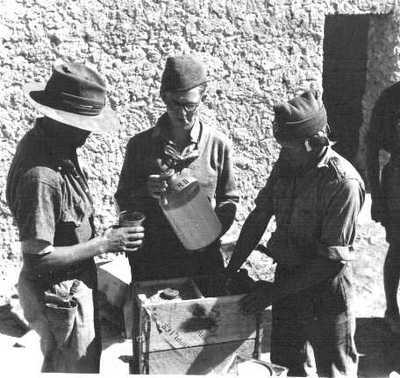 (Supply Reserve Depot) and another photo showing British Infantry during WWII pouring out rum from a demijon without wicker and the initials S.R.D. clearly showing. In the above photo to the left note the all-copper pitcher-shaped "Lipped Measures" also known as Haystack Pitchers came in various sizes from as small as 1/2 Gill to as large as 5 Gallons! 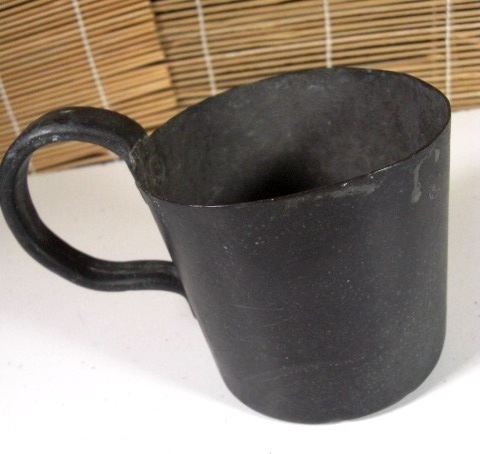 While used throughout England in the 19th/20th Centuries they were also used in the traditional mixing, measuring and dispensing of the "grog"! And the photo on the right illustrates on of these all copper Navy Grog pitchers, note the round lead badge on the inside rim. 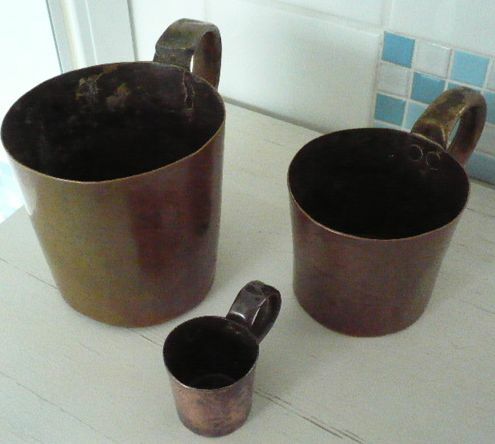 These all-copper measure lipped pitchers were tinned on the inside and had riveted handles just like their cousins, the rum or grog cup! 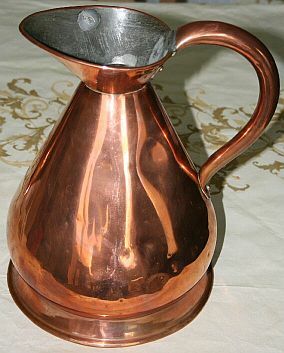 Additionally each of these pitchers had a lead stamp just on the inside rim showing the government inspection mark and royal cipher which "proofed" the pitcher to meet volume specifications. 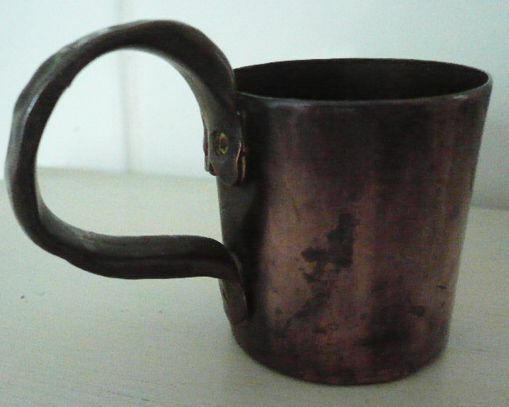 These lipped and government inspected pitchers were used widely across the UK from the early 19th century to the mid 20th century and there are literally 1,000s to be found. 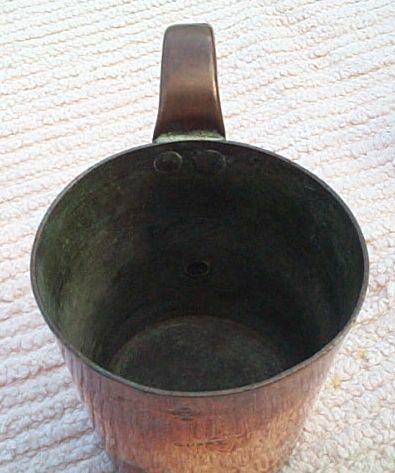 This Royal Navy All-Copper Measuring Pitcher, the Demijon, Mess Pail and other British Royal Navy Artifacts, Militaria and Antique Dinnerware is for sale and available by Clicking HERE - 19th and 20th Century British Royal Navy Militaria. For those of you who are interested in learning more about rum in general and how it changed the course of history there is an excellent recently released book entitled "Rum: A Global History" by well known culinary expert and author Richard Foss whose web page can be found by clicking here, Rum History - www.rumhistory.com.